Your birthday is the day when you feel that you’re the most special person in the world… that’s what I feel whenever it’s my birthday. And of course, birthdays are always celebrated with nothing else but a birthday cake. When I was a child, my birthday cakes included cartoon characters, balloons, miniature trees, a candle and the words HAPPY BIRTHDAY written in sweet icing. When I grew up, my cakes became carrot cakes, mango cakes, cheesecakes, or just plain cakes with a Happy Birthday greeting. When I saw the Red Ribbon commercial with Kendra making a personalized Red Ribbon Dedication Cake for her mommy, I really thought it’s heartwarming. 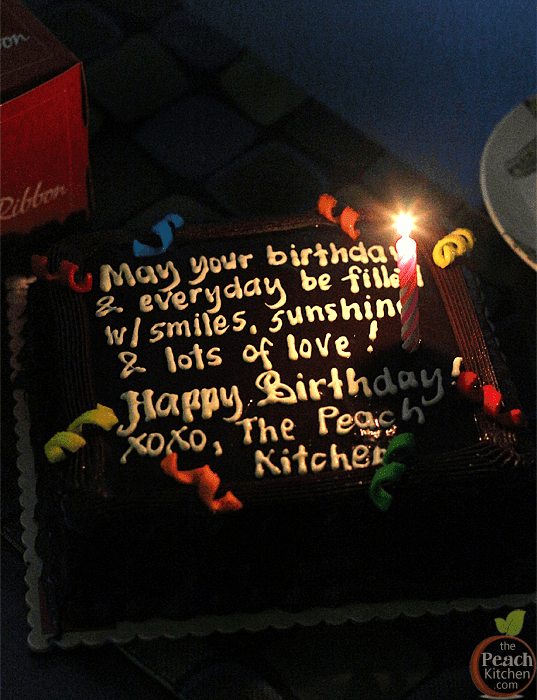 It’s a great idea too by Red Ribbon because you can go beyond the usual “Happy Birthday” greeting on your cake. With Red Ribbon’s Dedicaton Cake, you can greet your loved ones and place a personal message that your loved one will truly cherish. 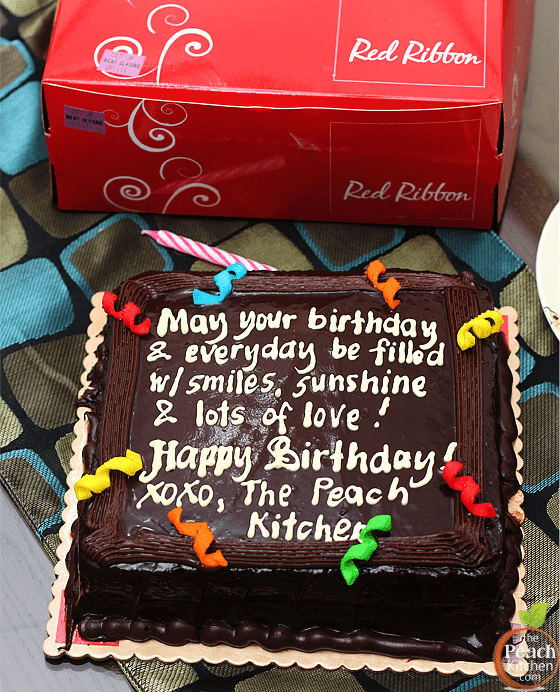 I have here a Red Ribbon Chocolate Dedication Cake 8×8 dedicated to all The Peach Kitchen readers celebrating their birthdays this month of September! Red Ribbon Dedication Cake is available in three sizes – 8×8 (₱300), 8×12 (₱500) and 12×12 (₱700) aand two flavors: Chocolate and Mocha. This contest is open to all readers living in METRO MANILA. Please follow and complete all the requirements on Rafflecopter. There will be only one (1) winner and the winner will be chosen based on how unique and creative the message is. 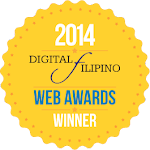 I will announce the winner on September 18, 2014. 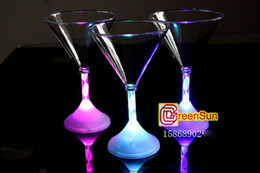 The winner will be notified through the e-mail provided on how to claim your prize. Good Luck and Thank you so much for joining! UPDATE: The winner of this giveaway is: Ms. Faith Hazel Almario! I will be e-mailing you on how you can claim your prize. *What is your most unique birthday message to your loved one who will be celebrating his/her birthday soon? – Mama, para kang red ribbon. Smooth mag-alaga, Tamis magmahal at higit sa lahat di nakakasawa! You are such a special blessing to me baby and I wish you a wonderful Birthday filled with love, joy and all good things you enjoy most! love you baby..
ng ang napakasarap na cake mo ay aming malasahan..
forget about your lesson plans and the test! For now let’s celebrate your best day ever! Mom, once again you’ll be spending our birthdays out of the country. I love you and miss you! A Brother like you deserves the best, today and always. MAHAL NA MAHAL KA NAMIN. To a woman who sacrifice there own Happiness for here children. To your birthday I just to say thank for being such a good mother to us, having a mother like you is a most beautiful gift gave from our God.Thank you Happy Birthday we love you. My birthday is on the 19th so the birthday message I will give will be for myself..
Istin, wag ka puro trabaho.. Lumablayp ka rin kapag may time. Its been 5 years na. The advantage of old age is that you get many people to love. you’re birthday would be always be special to us! May all the blessings you shared with us come back to you a hundredfold! Happy Birthday! Health, wealth, love, and joy! Daddy Bear, Mommy Bear & Ate Bear Singing Together to greet you a Happy Birthday. Blow your candles and dig in to your big cake. Enjoy your day son! You might not have felt how much thankful we are to have you as our parents. You might have felt failures and struggles but one thing for sure, I know we made you happy when you first saw me and my sisters. But that is never enough for us to show and let you know how lucky we are to have you both. In return to all the sacrifices and tears, here’s a birthday gift for you two. We love you so much and you both are the best parents in the world. Happy birthday Mamang and Papang!!! A greetings of love on your birthday across the miles. Message: To my son who is celebrating his 7th birthday this 17th, happy birthday, anak. These past 7 years have been the most adventurous, the most happiest, and the most meaningful time of my life and that’s because God gave me the most wonderful blessing a mother could have and that is you, my dearest son. No amount of money nor material things can show you how much I love you so let me just show you what unconditional love is. I love you, anak. Happy 7th birthday! I’m really lucky to have a MIL like you. I love you! Happy birthday Tya Nora! May the tooth fairy come and fill your mouth with teeth again, for you to enjoy your favorite cracklings. Hihi! Happy birthday and more years to come. Happy birthday to you Stephanie, may your birthday be full of cakes, candies, and chocolates, for you are my sweet munchkin. Love you apo. Happy birthday Mom! I just realized that, every year you light up my life more and more. (The birthday candles on your cake are just adding up!) Don’t worry, I will always be here to help you blow them up! I love you mom. You are the greatest gift! Happy, happy birthday Lola Noring! Congratulation on another year of life, and becoming older. I am sorry this is also an unfortunate event for now you are becoming more wrinklier and more tired, but hey I still love you anyway. Happy birthday again! 😀 Cheers! Love you! They say that you can count your true friends on 1 hand – but not the candles on your birthday cake! #HappyBirthday !!! Well, myself is the birhtday celebrant, hehehe..
May all your dreams and wishes be fulfilled! Happy Birthday! Wishing you a very Happy Birthday dear! I pray to God to bless you with all the joy, happiness and glory in the world. Pick up the knife and divide me! you’ll never catch up to me. Happy Birthday my dear sweet Bro! Happy birthday to my most awesome brother on earth.. I love you so much bro! but we gonna always treat like our baby. I don’t know anyone who makes their family the priority you always have. If you have a yummy cake, would you mind getting a year older? Good fathers and good husbands are difficult to find. But I’m very happy and lucky to be married to one! Happy Birthday Mahal! I love you to the moon and back! To my mother, celebrating her 60th birthday on February 4,2015.. Advance happy happy birthday dadaw! Salamat sa pag aaruga sa Amin mag ka kapatid. Alam ko na hindi madali ang maging tatay, at nanay sa amin. Bilib ako sayo dahil ang lakas ng loob mo sa mga pagsubok na dumating sa ating buhay.. Alam din namin na malaki ang pinag daanan Mong Hirap mapalaki lang kaming magkakapatid.. Dadaw, mahal na mahal ka namin, hindi ka namin papabayaan.. Kaya sa darating na birthday mo, sana mapasaya ka namin. We love you!! Our 11 years together are the best years of my life. And I am ready to count for more. You might be taller than me but you are forever our BABY. Sweet 16 Bunso! Happy birthday future Dr. King Alagao! You will always be Mine and I will always be Yours! Thank you mama for the infinity love you gave from us. We love you. Mwuah! Happy Birthday to my S-weet I-nnocent S-uper T-alented E-xtraordinary R-emarkable Sister Roshella Marie Belmes We LOVE YOU Sis <3 Have a Beautiful Day! Anak you are the most precious gift i ever had that give from god.i love you very muc.